hen the lights turn on for the 2004-05 University of Massachusetts men's basketball season, the Minutemen will open against a team with the ability to shoot them out. 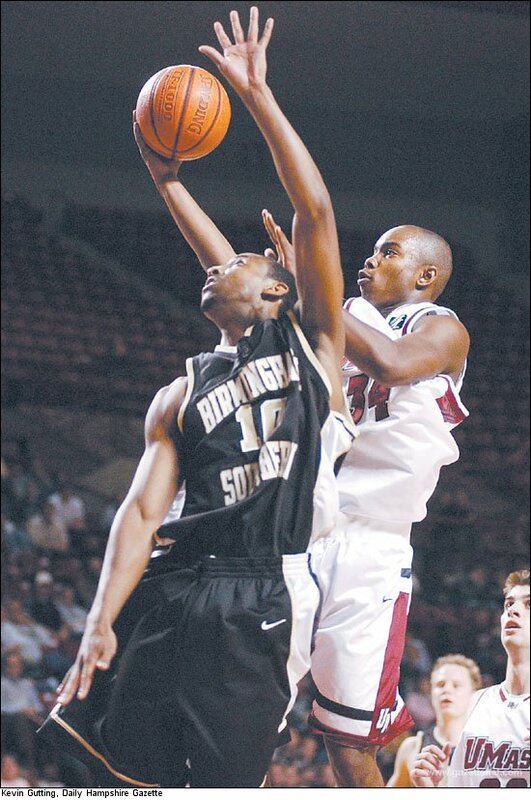 Birmingham Southern, which led the nation a year ago in 3-point shooting, will be at the Mullins Center at 7 tonight. The Panthers, an NAIA school until two seasons ago, aren't well known outside of basketball circles, but almost everybody has them picked to win the Big South title after going 20-7 last year. So far they've backed up those predictions by playing well in the early going and are 3-1. UMass senior point guard Anthony Anderson said the Minutemen aren't taking Birmingham Southern lightly. The Panthers led No. 14 Mississippi State Nov. 12 with 10 minutes left before the Bulldogs pulled away late. Birmingham Southern bounced back to win the Pepsi Marist Classic during the weekend with wins over Northeastern and Marist. Jakob Sigurdarson buried a driving layup with 8.9 seconds left to earn Birmingham Southern a 67-66 win in the championship game Saturday against Marist. A layup is particularly close range for Sigurdarson, a native of Iceland who specializes in long-range shooting. Although he's struggled from 3-point distance so far this year, he still leads the Panthers at 15 points per game. Backcourtmate James Collins is averaging 12.3 points per game and has made nine-of-20 3-point tries. Stopping 3-point shooting was a weakness for the Minutemen last year as they allowed opponents to shoot .381. UMass coach Steve Lappas agreed. ''This is going to be a good test for us because they're such a good 3-point shooting team,'' he said. In addition to a collection of marksmen, Birmingham Southern has a frontcourt that is deeper and more talented than most mid-major teams. Thomas Viglianco, a 6-foot-9-inch transfer from William & Mary, has been strong in the middle this season and is averaging 10.8 points and 8.8 rebounds. Shema Mbyirukira, a 6-foot-11-inch senior shot-blocker, doesn't start, but he's averaging 10 points and 5.3 rebounds off the bench. To counter that size, Lappas altered his own starting lineup from the one that finished last season and started the exhibition game against Concordia. Stephane Lasme will replace Jeff Viggiano starting inside for the Minutemen alongside Rashaun Freeman. Viggiano will come off the bench. Anderson will start at point guard with Artie Bowers and Maurice Maxwell on the wings. The game will mark the debuts of three Minutemen - Lawrence Carrier, Olivier Lamoureux and Jeff ''Big Deli'' Salovski - who could all see action off the bench. Lappas said Salovski, who suffered an elbow sprain last week, is healthy enough to play. NOTES: Nana Ampim, a 6-foot-1-inch freshman guard from London, England, by way of South Brunswick, N.J., has joined the Minutemen as a walk-on. The game will air live on WRNX-FM (100.9). The UMass hockey game at Vermont scheduled for the same time will be heard on tape delay after the basketball game ends. MHERST, Mass. - Junior Maurice Maxwell (Philadelphia, Pa.) led UMass with 17 points, including four three-pointers, and the Minutemen hit 10-of-14 free throws in the last 70 seconds to defeat Birmingham-Southern 64-60 in the season home opener on Tuesday night. Sophomores Art Bowers (Wilmington, Del.) and Rashaun Freeman (Schenectady, N.Y.) and senior Anthony Anderson (Lynn, Mass.) also posted double-figure scoring efforts in leading UMass to its 10th win in the last 12 home openers. Bowers scored 15 points on the strength of 6-of-15 shooting from the free throw line. Anderson and Freeman scored 12 and 14 points, respectively. Anderson chipped in five steals and three assists, while Maxwell recorded four assists and three steals. BSC (3-2) trailed 54-52 after three-pointers by Maxwell and Anderson sparked a 7-1 Minuteman run late in the second half. The Panthers missed an opportunity to take the lead missing four consecutive free throws. UMass (1-0) wrapped a 29-to-9 run around the intermission to take its largest lead of the game at 42-24 just as the second half started. The Minutemen shot 55.6 percent in the first half led by Maxwell's 12 points - highlighted by a buzzer-beating three-pointer. Birmingham-Southern switched to a match-up zone in the second half slowing down the Minuteman shooters. Anderson hit a three-pointer at the 6:30 mark giving UMass a 50-49 lead and breaking a 5:29 scoreless dought. The Panthers had just taken the lead with 6:57 remaining on a pair of Jimmy Amerson free throws wrapping up a 25-to-7 run - the first BSC lead since 16-15 at the 10:05 mark of the first half. For the second half, Birmingham-Southern shot 12-of-24 from the field, including 5-of-9 from downtown. Jakob Sigurdarson led all players with 18 points on 7-of-12 shooting. Thomas Viglianco scored 11 points and pulled down nine boards to lead the Panthers. Birmingham-Southern hit its first four field goals of the first half before the Minutemen held them to just 5-of-17 for the remainder of the period. The Minutemen took care of the ball committing just six turnovers, one in the second half, while converting 16 Panther miscues into 17 points. UMass will next host Yale on Sunday, Nov. 28 with tip-off slated for 2:00 p.m.
Mass won its second-ever game against a team from the Big South Conference with a 64-60 win over the conference's preseason favorite Birmingham Southern. � Maurice Maxwell scored a team-high 17 points, for his sixth time in double-figures in eight games, dating to last season. � Freshman Jeff Salovski made his first two career free throws to secure the win in the final minute of the game as he entered after Rashaun Freeman and Stephane Lasme fouled out. � UMass made 10-of-14 free throws down the stretch after starting the game 5-of-13. � Rashaun Freeman netted 12 for his sixth straight game with 10 or more points, dating to 2003-04. � Anthony Anderson is now tied for third on the career three-point attempts list with 592, as he tied Rafer Giles (592) on the list in the game. � UMass canned seven 3-point field goals in the first half as Anthony Anderson made three in the first 20 minutes while Maurice Maxwell had three more treys. Maxwell (12) and Anderson (11) led all scorers in the first half. 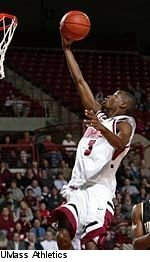 � UMass closed out the first half on a 27-9 run, as they rallied from a 15-13 deficit with 11:13 left in the first half. � The Minutemen assisted 12 of their first 15 baskets of the night in the first half. 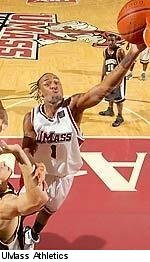 � Stephane Lasme made his third career start in the game, he also started at Duquesne (1/18/04) and Xavier (2/14/04). � UMass has now won 10 of its last 12 season openers. � UMass is a perfect 6-0 in season openers which are played at the Mullins Center. 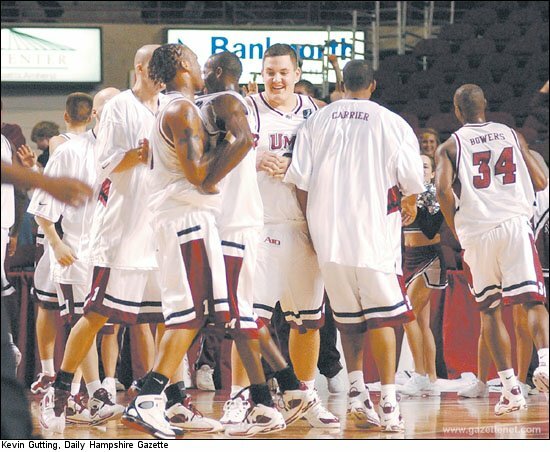 � Overall, UMass is 63-33 all-time in season openers. Other Notes... UMass won the opening tap.... The first points of the season were scored by Maurice Maxwell on a free throw, 18:28 into the game ... the first basket of the season was scored by Art Bowers on a three-point field goal 16:26 into the game ... BSC made its first four shots of the night (but went 5-of-18 to end the first half) ... the first subs of the night for UMass were Chris Chadwick and Jeff Viggiano with 14:57 left in the first half ... Freshman Lawrence Carrier made his collegiate debut with 12:09 left in the first half ... Jeff Salovski made his UMass debut with 8:07 left in the first ... The Minutemen's largest lead of the first half was 16 (40-24), the margin at halftime. "I thought our kids did a great job of keeping their poise against a good team. We had only one turnover in the second half. I thought our kids did a great job handling the ball in practice over the last 10 days. The only difference in the second half was that we weren't making our shots. Rashaun and Stephane were in foul trouble and it was a tough night for that. Then Big Deli (Jeff Salovski) and he did a great job. I put him in because he's an excellent foul shooter. I'm surprised he missed two to tell you the truth. I thought he'd make them all, but I'll forgive him. He was probably a little nervous. Overall, I thought our guys showed great poise against a very disciplined and very good team." "What he did was big. He barely played all game. He came in, got some rebounds and hit big foul shots. We need that from guys like him." "I think we did a good job keeping our poise. Last year, we would've lost our poise when we started missing our shots." "Honestly I was thinking don't put me in. It's big for a freshman to come in with two minutes left in the game when the game is on the line. I was trying to think of it as the beginning of the game. When I got that first rebound though, my mind went somewhere else. I didn't even feel like a freshman." "I didn't expect it. But it was good that they were like that because it helped me out more. It helped me get settled." "It was close. It would've been nice to blow them out and win by 20. But it's also good that we gave up a lead and kept our poise and played defense, knocked down foul shots and won the game. We showed that we can win the close games." MHERST, Mass. - Despite erasing an 18-point second-half deficit, Birmingham-Southern fell just short in its upset bid at Massachusetts Tuesday evening, falling 64-60 to the Minutemen before 3,122 at the Mullins Center. BSC trailed just 54-52 following a 3-pointer by Jakob Sigurdarson with 3:16 to play, but, with a chance to tie, missed four consecutive free throws and could get no closer. Meanwhile, UMass made 10 of its final 14 free throws in the final 1:37 to seal the win. Sigurdarson led the Panthers with 18 points, followed by Thomas Viglianco with 11 and James Collins with 10. Maurice Maxwell led four Minutemen in double figures with 17 points. Art Bowers added 15, Anthony Anderson 14 and Rashaun Freeman 12. The hot outside shooting of Maxwell and Anderson, who were a combined 6-for-8 from 3-point range in the first half, helped give the Minutemen a 40-24 advantage at halftime. UMass took its largest lead of the game at 42-24 on a layup by Freeman 30 seconds into the second half. But the Panthers began chipping away at the lead and went on a 25-5 run over the next 12:40. Three-pointers by Sigurdarson and Collins, sandwiched a tip-in by Shema Mbyirukira to cut the lead to just two at 47-45. BSC's Arnold Gore pulled the Panthers even with a follow dunk after a miss, and Jimmy Amerson's two free throws gave BSC its first lead since halfway through the first half at 49-47 with 6:57 to play. But Anderson, who had been held scoreless in the second period, drained a three on the next possession to end a five-and-a-half minute scoring drought and give UMass the lead for good. Following a Panther turnover, Maxwell got in the act and hit a trey as time expired on the shot clock to put the Minutemen up 54-49 with 4:31 to play. BSC hurt itself from the free throw line, making just 11-of-21 on the night. The Panthers shot 45.7 percent from the floor and only 33 percent (7-of-21) from behind the 3-point arc. After shooting nearly 56 percent in the first period, UMass cooled off to manage just 22.7 percent in the second, and finished the game 40.8 percent from the floor. The Minutemen were 9-of-20 from the 3-point line, and 15-of-27 off the free throw line. Viglianco grabbed a game-high nine rebounds for BSC, who out-rebounded UMass 39-27. Birmingham-Southern returns to action Saturday at 2 p.m. when it entertains Tennessee Wesleyan in the Panthers' home opener. Notes: With his 18-point outing, Jakob Sigurdarson moved into 12th place on the all-time scoring list at BSC with 1,086 points. aurice Maxwell led four Minutemen in double figures with 17 points and Jeff "Big Deli" Salovski hit two crucial free throws down the stretch as the Massachusetts men's basketball team downed Birmingham Southern 64-60 before 3,122 on opening night at the Mullins Center. Sophomore guard Art Bowers chipped in with 15 points and senior captain Anthony Anderson added 14 points and five steals as UMass used a strong first half and clutch shooting late in the game to win its sixth consecutive season opener in Amherst. Sophomore forward Rashaun Freeman, who led the Maroon and White in scoring last year at 15.9 points per game, contributed 12 points and seven rebounds before fouling out late in the contest. "I thought our kids did a great job of keeping their poise against a good team," UMass head coach Steve Lappas said. "Getting the first one out of the way at home is always a good feeling. We're not going to go overboard, and as we told the kids we want to get better one game at a time and see what it adds up to. UMass took a 40-24 lead into halftime and led by as many as 18 early in the second half before going cold offensively and allowing Birmingham Southern to climb back into the game. Following a jumper by Freeman which made the score 45-30 with 16:16 to play, the Minutemen endured a stretch of 10:16 in which they scored just five points, and allowed the Panthers to narrow the lead to one. After a basket and two free throws by Thomas Viglianco made the score 45-34 with just over 15 minutes to play, James Collins and Jakob Sigurdarson each made 3-pointers sandwiched around a basket by Freeman to narrow the lead to 47-40 at the 11:30 mark. The Panthers then proceeded to score the next nine points, and Jimmy Amerson's two free throws with just under seven minutes remaining gave Birmingham Southern its first lead since the 10 minute mark of the first half. Anderson answered back immediately for UMass, however, as his 3-pointer on the very next possession helped the Maroon and White regain the lead at 50-49. Bowers and Maxwell then combined to spark a 6-2 run that pushed UMass' advantage to 56-52 with 1:37 left. The teams then traded free throws for the remainder of the game, including a pair from Salovski in two trips to the line, before Viglianco gave the Panthers one last gasp by hitting a 3-pointer with two second remaining. The Minutemen were able to inbound the ball from under their own basket, however, and Bowers sealed the deal by hitting 1-of-2 from the line. "The difference from last year is that the experience will help us win games along the way, while we're still getting better," Lappas said. "This is not the best basketball we're going to play this year ... but come January we're going to be playing a lot better than this." f there were a class on how to hit clutch shots, Maurice Maxwell would be an apt teaching assistant. In the Massachusetts men's basketball team's 64-60 victory over visiting Birmingham Southern, Maxwell hit two of the biggest shots of the contest en route to an impressive 17-point game. Even more astounding was his accuracy behind the arch where he went 4 for 6 for the evening. Maxwell, who is usually a defense-minded player, capped off an impressive first half for UMass with a last second 3-pointer which put the Maroon and White up 40-26. With time running down, Maxwell created his own shot on the top left corner of the arch. He pulled up, faded back, and before the ball hit the floor he was in the air, arms raised with an ear to ear grin for the whole crowd to see. The 3-pointer was an integral part of the Minutemen's success sin the first half as they scored 21 of their first half points from behind the arch. The Panthers, however, made a defensive alteration, switching from a zone to man-to man pressure in hopes of shutting down the outside game. For the majority of the second half, UMass couldn't hit anything. Its field goal percentage dropped dramatically from an astounding 55 percent in the first half, to a lowly 22 percent in the second. "I thought that the only difference in the second half was that we didn't make shots that we were making the in first half we didn't make in the second half," Lappas said. When it wasn't working from the outside, Lappas had the Minutemen work it in to Rashaun Freeman and Staphane Lasme. Foul trouble, however, caused both to be relegated to the bench for a majority of the period. The Panthers brought it back, took the lead, and it appeared that UMass was heading towards a collapse of colossal proportions. Just as the going got tough, Maxwell got his hands on the ball again and gave the Minutemen the momentum they desperately needed. With 4:30 left in the game, the ball was stuck around the perimeter and the shot clock was in the waning seconds. Maxwell got the ball, this time on the top right, and nailed a three as the buzzer sounded, sending the 3,122 fans in attendance into frenzy. "I think Maxwell hit a three in the second half when they were having a difficult time." Birmingham Southern coach Duane Reboul said. "That kind of ignited them and allowed them to get back into a groove." Maxwell was quick to mention how pleased he was with the shot, but also knew he had to focus his excitement and stay with the flow of the game. "I was happy, you know, but then I knew I had to get back on D [defense]." Maxwell said. "Everybody wants to hit big shots but when you hit one, you know you wanted to hit it but you're still like, 'Yea!' you know?" MHERST - The first 10 minutes of UMass' season-opener last night were just fair, the next 10 minutes were very good, and the 13 minutes after that were simply dreadful. That left the last seven minutes, which were all about survival for the Minutemen. They used a pair of clutch 3-pointers to regain the lead and made 10-of-14 foul shots in the final 1:37 to secure a 64-60 victory over Birmingham-Southern before 3,122 at the Mullins Center. With 6:57 to play, the Panthers (3-2) grabbed a 49-47 lead on two foul shots by Jimmy Amerson, capping a 25-5 run that erased an 18-point deficit. 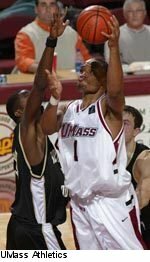 But Anthony Anderson (14 points) and Maurice Maxwell (17 points) sandwiched 3-point shots around a free throw by Art Bowers to put UMass ahead 54-49, a lead the Minutemen managed to maintain until the end. Freshman center Jeff ``Big Deli'' Salovski became an immediate Mullins Center folk hero when he stepped to the foul line twice in the final 30 seconds, and the 6-foot-11, 325-pounder made 1-of-2 on both trips to keep UMass out of danger. Until those late points, only five Minutemen had cracked the scoring column. A back-and-forth first 10 minutes saw the Panthers in front 16-15, before Maxwell knocked down three 3-pointers and Anderson hit from deep twice. UMass made nine of its last 11 shots of the half, energizing a 25-8 run. Maxwell let a Panthers defender go sailing by and calmly drained a trey at the horn for a 40-24 halftime lead. The Minutemen finished the half shooting 56 percent, but made only 5-of-22 (23 percent) thereafter. Rashaun Freeman, who fouled out with 2:35 left, had UMass' only three baskets over the first 13 minutes of the second half. Freeman's layup 23 seconds into the half gave UMass its largest lead, 42-24, before the Panthers began to overtake the Minutemen behind Icelander Jakob Sigurdarson (game-high 18 points) and big man Thomas Viglianco (11 points, nine rebounds). MHERST -- The University of Massachusetts men's basketball team opened its season last night against some rather imposing shadows. It was 10 years ago this week that John Calipari's Minutemen opened the 1994-95 season in the Tip-Off Classic with a resounding 104-80 victory over top-ranked Arkansas, the defending national champs. A few days later the Globe printed a red number 1 on the length of the sports section front, commemorating the first time in the 45-year history of the Associated Press poll that a New England team had made it to the top. A decade later, that seems like the loneliest number for the Minutemen. Coming off three straight losing seasons and facing the symbolically awkward return of Calipari to western Massachusetts Friday night (when his Memphis squad takes on Maryland in the Tip-Off Classic), UMass opened its make-or-break season for coach Steve Lappas last night against Birmingham-Southern. With such stakes, the opener had added importance, and UMass responded in encouraging fashion with a gutty 64-60 victory. The Minutemen were alternately luminous and lackluster, building a 16-point halftime lead with great perimeter play, watching it swell to 18 at the beginning of the second half, and then seeing it vanish when the Panthers took a 49-47 lead on two Jimmy Amerson free throws with 6:57 left. UMass responded with a poise that was lacking in similar meltdowns a year ago. The Minutemen got key 3-pointers from Anthony Anderson and Maurice Maxwell to open some room, and then held off the Panthers by hitting 10 of 14 free throws down the stretch. "I'm almost positive we wouldn't have won this game at this time last year," said Maxwell, who led four Minutemen in double figures with 17 points. "It feels totally different, wanting to win more, knowing how to win. When the time is right there, you don't even think about last year. You just think about what it takes." It took a surprising contribution down the stretch from 6-foot-11-inch, 325-pound freshman Jeff Salovski, who was forced into crunch-time minutes when Rashaun Freeman and Stephane Lasme fouled out on consecutive plays with 2:35 and 2:33 left. Known to friends and teammates as "Big Deli," Salovski ordered up a beefy hero when he grabbed a defensive rebound with 29.8 seconds left and UMass ahead, 58-55. He was fouled, and then forced to wait when Panthers coach Duane Reboul called a timeout. Salovski hit one of two free throws to make it a two-possession game, and moments later hit one of two again to extend the lead to 60-55. He finished with 2 points and three boards, and became an instant favorite of the home crowd of 3,122. UMass got 15 points from Art Bowers, 14 from Anderson, and 12 from Freeman. The Panthers were led by Jakob Sigurdarson, a senior guard from Iceland, who scored 18.
ith the University of Massachusetts clinging to a two-point advantage with just over five minutes left Tuesday, Birmingham Southern guard James Collins lobbed the ball toward the paint trying to set up the game-tying basket. Anticipating the pass, Minuteman guard Maurice Maxwell leaped well off the ground to intercept it in front of the Panthers' bench. At the other end, UMass worked the ball around the perimeter until Anthony Anderson found Maxwell for an open 3-pointer. The play seemed to deflate Birmingham Southern, which erased an 18-point second-half deficit but fell to UMass 64-60 at the Mullins Center. The Minutemen weren't out of the woods after Maxwell's 3-pointer. After Jakob Sigurdarson (18 points) made a 3-pointer to cut UMass' lead back to two points, Rashaun Freeman and Stephane Lasme fouled out on successive plays but Birmingham Southern missed four straight free throws. With no experienced big man left on his bench, UMass coach Steve Lappas inserted freshman Jeff ''Big Deli'' Salovski and the 6-foot-11-inch, 350-pound rookie delivered, grabbing two rebounds and making two free throws to put the game out of reach. The Minutemen (1-0) will return to action at 2 p.m. Sunday when they host Yale. While the players were frustrated with their second-half struggles, they said the win represents progress. ''I'm almost positive we would not have won this game at this point last year,'' Maxwell said. Maxwell led the Minutemen with 17 points, four assists and three steals. Anderson added 14 points and matched a career high with five steals. Bowers scored 15 and Freeman had 12 points and seven rebounds before fouling out. Thomas Viglianco led the Panthers (3-2) with 11 points and nine rebounds. After falling behind 6-1 to start the game, the Minutemen were nearly flawless for the rest of the first half. They finished on a 14-1 run and led 40-24 at intermission. But UMass' shooting went cold quickly after the break and Birmingham Southern took advantage, using a 25-7 spurt capped by a 12-0 run to take a 49-47 lead with just under seven minutes left. Anderson, who struggled early in the second half, made a 3-pointer to pull his team back ahead, 50-49. Bowers added one of two free throws to set up Maxwell's momentum-seizing sequence. Lappas said the win gives the Minutemen something to build on. NOTES: Foul trouble inside hurt the Minutemen on the glass as they were outrebounded 37-29. ... UMass had just one turnover in the second half and six for the game. ... Sophomore Lawrence Carrier played two minutes in his collegiate debut, while neither freshman Olivier Lamoureux nor senior Brennan Martin saw action. hen University of Massachusetts coach Steve Lappas looked down his bench with 2 minutes and 33 seconds remaining Tuesday, he didn't have many options. Rashaun Freeman and Stephane Lasme, his only two experienced big men, had both just fouled out within a two-second time frame. As freshman Jeff ''Big Deli'' Salovski looked up at Lappas, he had one thought in his head. ''Honestly, I was thinking, 'Don't put me in,' '' Salovski said in the postgame press conference, drawing chuckles from his teammates. But Lappas did pick Salovski, who had played three first-half minutes, over Lawrence Carrier, who'd played two, and Olivier Lamoureux, who hadn't even taken off his warmups. Nervous or not, Salovski may have saved the Minutemen for what would have been a rough season-opening loss and taken a big step toward cult hero status. The Bristol, Conn., native grabbed two key rebounds and knocked down a pair of big free throws in the final minute, helping the Minutemen escape with a 64-60 win over Birmingham Southern. ''That was huge. He barely played all game and he came in and gets rebounds and hit big foul shots,'' senior captain Anthony Anderson said. Salovski, who earned his nickname after a youth basketball coach watched him polish off a particularly long sandwich, heard it chanted by an appreciative Mullins Center crowd when he checked out of the contest. Salovski said their encouragement helped him conquer his nervousness. ''It was good that they were like that. It helped me get settled into the game,'' Salovski said. His considerable dimensions - he weighs more than Anderson and Maxwell combined - might have endeared him to fans, but Salovski brings more than mass to UMass. In addition to his rebounding and free throws, he used his boxcar-like frame effectively on defense, forcing driving guards to alter their paths to the basket. With this game behind him, Salovski wasn't hesitant when asked if he'd want to get the call again with the game on the line. Jeff Salovski, in the middle of things just before halftime, proved to be a key player in the game. Points in the paint-BSC 18,UMASS 22. Points off turnovers-BSC 7,UMASS 17. 2nd chance points-BSC 12,UMASS 7. Fast break points-BSC 2,UMASS 6. Bench points-BSC 23,UMASS 6. Score tied-3 times. Lead changed-9 times. Last FG-BSC 2nd-00:02, UMASS 2nd-04:31.